Have you ever heard of purple fluorite stone? It is closely linked to fluoride – the standard preventive to teeth’s health – and also to the phenomenon of fluorescence, which is present in this stone and is part of its natural beauty. But beyond the physical aspects, this stone also participates effectively in healing processes of alternative therapies. Know the power of this stone and how to use it. The fluorite stone is so powerful because it collects within itself a little of all other crystals. It is considered a stone of trust, conscience, intuition, cleanliness, luck and love. Other than purple fluorite, there many fluorite stone varieties, such as yellow, white, green, blue, pink, orange, brown and other color blends. They all have healing power, but each tonality has a different power by connecting with one of the body’s chakras. By being a multidimensional stone, it is able to increase the perception of the greater aspects of the mind connected the spirit, bringing healing from the inside out. Because of its crystalline system, it is the stone that structures thought and brings clarity to the mind. It dissolves fixed ideas. It promotes concentration and is useful for children’s learning. It brings new ideas. It activates the chakra of the 3rd eye. It strengthens the memory. It is a good support for bones and bone marrow. Purple Fluorite makes us more self-determined. It brings inner peace. It helps us find the answers to the difficulties we face. It is a stone that facilitates and induces the meditative state. It is indicated for those who have difficulty in meditating or want to go deeper in meditation. It is a stone of awareness, helps balance the mind, balance ideals and find solutions and exits to the different difficult situations of life. It makes us see, face and understand the various angles of a question, directly. There are those who say that this stone is a true friend because it gives us support and helps us, just straight to the point, giving confidence and courage. But beware: it is no use to use fluorite if you are in a state of denial, not wanting to change the problems of your life, it will not work miracles for you, it will only help you, boost, support and enlighten your mind. In addition to being a stone of awareness, it is also a cleansing stone as it is able to absorb all negative energy from environments and people. It helps to release unconscious desires, feelings, and wisdom that exist within us. Through fluorite stone, we feel a spiritual awakening and we begin to feel more love in partnerships and friendships. The purple fluorite stone is considered a healing crystal. It is soothing, helping to free you from insomnia, aggression, and anxiety – and the best is that it has no contraindication or risk of overuse. In addition to promoting mental health, it is also an ally in the treatment of blood, gums, joints, teeth, and bones, by the fluoride contained in its composition. It is indicated for those who have the flu, constipation or allergies, as it favors the functioning of the lungs, causing a faster recovery. 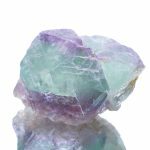 Fluorite stone further aids in skin suppleness, preventing premature aging, and stimulates sexual attraction even at later ages.